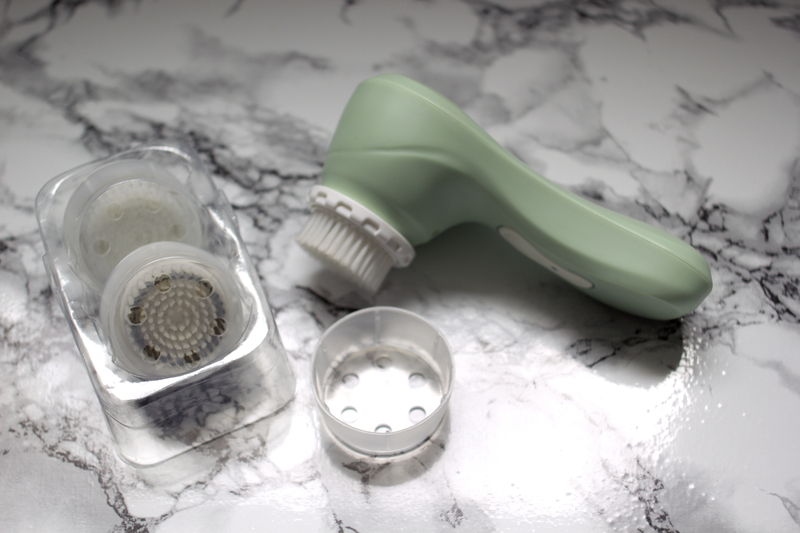 I know there have been a lot of posts about the Magnitone Lucid* popping up on blogs over the last few months, but as a complete cleansing brush virgin, I was thrilled to be able to give it a try! Now, as a bit of a side-note, my skin is quite blemish prone and is a combination skin type. I have had many periods, particularly through summer, when my skin can get quite oily but during winter it gets so dry it could even be described as flaky. Gross, I know! One thing my skin isn’t though, is sensitive. Very few products have caused my skin to have an adverse reaction so I know it’s quite resilient in that aspect so I was very excited to get stuck in when my Magnitone arrived! The brush heads on the brush and at the back of the box are the Silk Bliss Luxury Brush Heads and the one at the front of the box is the Active Clean Brush Head. There are many things I love about this product, but my reviews are also honest so I will also be mentioning the things that I wasn’t so impressed with too, later on in the post. First off though, lets start on a high; I absolutely love the design of this product! The chunky brush and stylish choice of colours make it a lovely addition to my dressing table! I picked the colour Aqua Green for mine as I love anything that is a minty colour, as I feel like it looks so modern and fresh! This particular brush does come in three other colours though, Blush Pink, Dazzling Blue and Sunshine Yellow, and there is also a limited edition version by Pixie Lott! All of the colours retail for the same price of £69.99 which I think is quite a reasonable price as you do get one brush head included in that price. I have seen a lot of brushes on the high street that are between the £20 – £30 mark so, seeing as this is a more high-end product I feel like it priced much more reasonably than the Clarisonic for example. The designers of this brush have really thought about ever aspect of this brush and to be honest, there is not one thing I would change about it in that aspect! Firstly, there are two settings, Regular and Sensitive which is great as you can decide how intense a clean you would like to have just through the click of a button. The brush also comes with a cap to cover the bristles when it is not being used or while you are travelling, to keep things much more hygienic! The main thing that has impressed me though is the incredible lasting power of the charge on this device and also how the charger actually works! Rather than plugging the charger into the device, which would run the risk of damaging how waterproof the device is, you rest the charger on top of the handle and a magnet secures it in place. Personally, I love this feature as Tom’s Mum uses the No7 Brush which runs on batteries and each time you replace the batteries the waterproof seal is broken and the brush only lasts around a year. You want something like a cleansing brush to be a more long term investment so I feel like Magnitone have got this element spot on! There are also lights to let you know what setting you are on and also if the device needs charging, which I have yet to have to do, even after a month of using this product every night! I cannot believe how well the battery has lasted and I am seriously impressed! Now, onto how the Magnitone Lucid has actually effected my skin! The brush head that comes with the brush is the Active Clean Brush Head which is meant to be suitable for daily cleansing. I had read on a lot of blogs that your skin gets worse in that first week of use before it gets better, so I was prepared for that, however after three weeks of use, my skin was still very spotty and it was starting to get me down a bit! My skin definitely looked healthier in terms of plumpness and it had a bit more of a glow, but the spots seemed to be springing up everywhere! It was then that I decided to get into contact with the lovely ladies at Magnitone to see what they suggested as I thought perhaps I was doing it wrong or maybe it just wasn’t suitable for my skin. I spoke to two very helpful ladies who suggested that I try the Silk Bliss Luxury Replacement Brush Heads* which are slightly more expensive but a lot softer and may be more gentle on my skin. They retail for £19.99 for two replacement heads compared to £15.99 for two of the replacement Active Clean heads. Less than 48 hours later they arrived and I was seriously impressed by how soft they were! Silk bliss is definitely an apt name for them! The bristles are much finer than with the Active Clean heads and they are so silky and soft! I am also really happy to say that they did the trick and within less than a week, my skin had dramatically improved in terms of how many spots I had. I am going to continue using these for the next few months and I may do another post with how my skin is holding up further down the line if this is something you would like to read? The main thing I love about this brush is simply how easy it is to use! When you turn the brush on it beeps at both 20 and 40 seconds and turns off after 60 as that is how long you are meant to us it for. This makes it so easy as I start on my forehead, when the first beep sounds, I move onto the right side of my face and neck and after the second beep I more onto the left hand side. They could not have made it any simpler really! Have you tried the Magnitone Lucid or any other cleansing brush? Would you like to see an update post in the future? * Magnitone very kindly offered me the Brush at a cheaper price and sent me the Silk Bliss Brush heads for free. I am very grateful for their generosity but I must stress that all opinions are my own. I have given this brush a thorough test run until I was confident that I could give you a genuine review. The BB Cream You Don’t Need In Your Life! I’ve nominated you for the loyalty and real neat blog award!